Still trying to post an album a day, to keep you-all fully loaded for when I take my holiday break. The Iron Man of Blogging continues! 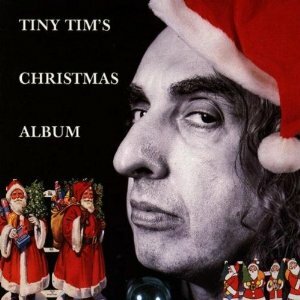 Today's album pretty much does what it says on the tin - unlike the stripped-down Tiny Tim album I posted last week, this is a big-budget, fully orchestrated work (except for one solo uke tune) that suggests that some nut thought that a modern Tiny Tim album might actually have commercial potential. This album certainly starts off as normal anything Tiny ever did, but goes off the rails eventually, as we all knew it would, with an epic version of "Silent Night" that features a pulpit-pounding sermon from a fiery "Reverend" Tim. What the..? Also far from silent is the incredibly bombastic 8-minute medley. The songs are the same ol' same ol' until we get to the last few tracks, when Tim finally gets to dig into his bag of old-fashioned obscurites. His famous falsetto is still in effect on this 1996 release - shortly after this release he claimed he couldn't sing like that any more. Album cannot be downloaded... copyright issues. (sigh)...thanks, anon. all right, zippyshare link up now. If only he'd included a version of 'I Want a Hippopotamus for Christmas' this album might just have been the ultimate Yule Tide soundtrack*.